Susan Stamberg's Other Favorite Holiday Cranberry Dish Every year, on Thanksgiving, Susan Stamberg recalls a cranberry relish recipe that's now infamous in public radio land. But another cranberry dish has also graced her holiday table through the years — a cranberry chutney that is sweet, tart and packs a kick of cayenne pepper. NPR's Susan Stamberg has a booming laugh, a probing mind, and, of course, a cranberry relish recipe that's infamous in public radio land. But there's another dish that has graced her holiday table through the years — a dish that's been overshadowed by her mother-in-law's cranberry relish. It's Madhur Jaffrey's cranberry chutney. Jaffrey is an actress who has become perhaps the world's best-known authority on Indian cooking, authoring more than 15 cookbooks. Stamberg says Jaffrey came up with the recipe by pulling together the ingredients she had on hand: A can of cranberry sauce with berries, fresh ginger, chopped garlic, cider vinegar, sugar, cayenne pepper, salt and pepper. "What you get is just this wonderful kind of sweet, sour and spicy thing," Stamberg says. "You know there are some Thanksgivings in which it just runs away. I mean it just takes over the table and I notice that most of it is gone." The Pepto-Bismol pink cranberry relish that has become a Thanksgiving tradition on NPR's airwaves, Stamberg admits, doesn't always disappear so quickly. You can find recipes for both Madhur Jaffrey's Cranberry Chutney and Mama Stamberg's Cranberry Relish below. Cut ginger into paper-thin slices, stack them together and cut into really thin slivers. Combine ginger, garlic, vinegar, sugar and cayenne in a small pot, and simmer on medium flame about 15 minutes or until there are about four tablespoons of liquid left. 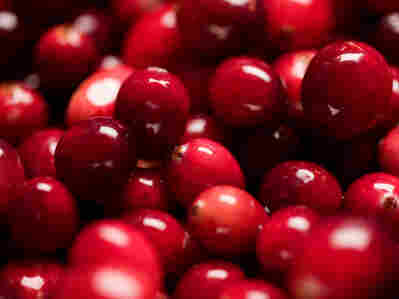 Add can of cranberry sauce, salt and pepper. Mix and bring to a simmer. Simmer on a gentle heat for about 10 minutes.